The GS-0033 is a clamp assembly that has the function of the specialized pliers that were a part of every AK armorer’s tool kit. This clamp fits the standard catches as well as the bulged catches of the Polish and East German rifles and the slightly longer dimpled catches of the Krinkov SBR’s. One of the most hateful tasks of building or servicing these rifles is the removal and especially the installation of the magazine catch due to the limited space and the high spring tension. Unlike the specialized pliers, the clamp can be used to hold a magazine catch as long as needed – allowing one’s hands to be free for other tasks. It is manufactured of hardened steel for long service. A pointed slave pin made from hardened steel is included with each set of pliers. 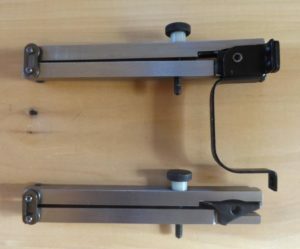 GS-0033 shown in use to extract (upper half) a magazine catch, and with a catch stored (lower half) and ready to install.